We arrived in Antigua for the second time as part of our plan to 1) visit with our friends on Hotel California who have been stuck on Antigua getting their boat repaired; and 2) as the planned stopping point to prepare our boat before we might leave for the Mediterranean (this does not seem likely because of the Iraq war). Read about our first visit to Antigua. First, we needed to get to Antigua from Grenada. We departed on March 27, 2003 from St. George, Grenada at 7:00 AM - with a long sail ahead of us. 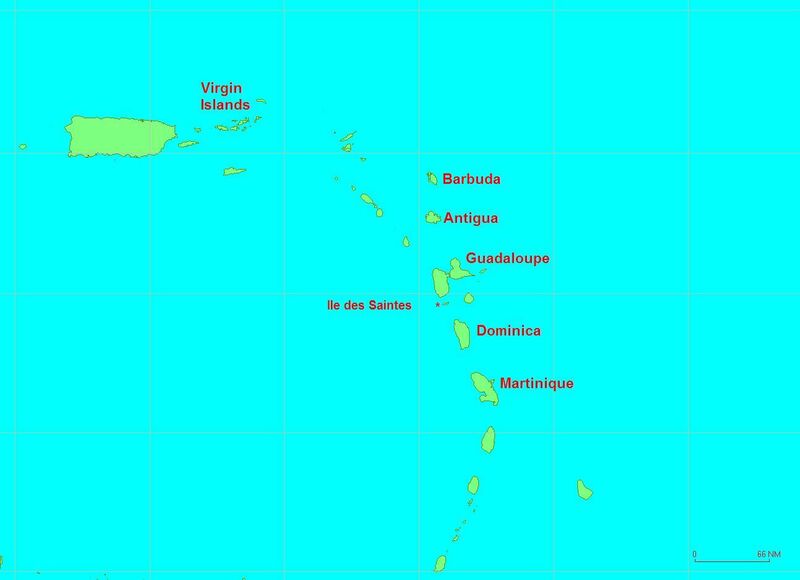 We planned to go straight to Rodney Bay, St. Lucia - about 140 miles away. We were fortunate in that the seas were very nearly flat on this passage. 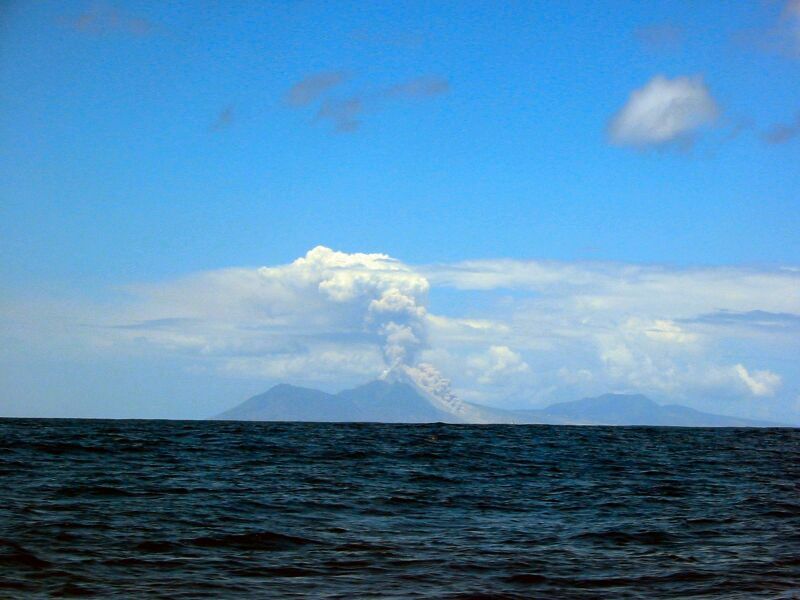 Partly due to being in the lee of the islands, and also because the winds had been light recently. We had to motor in the lee of Grenada, St. Vincent and the final stage coming into St. Lucia. But, the rest of the time we had a good sail in 12-15 knots of true wind. So, we made good time. We arrived to Rodney Bay at 11:45 PM. It was quite dark (there being a near new moon), so we had to use the spotlight to find a good anchorage spot. 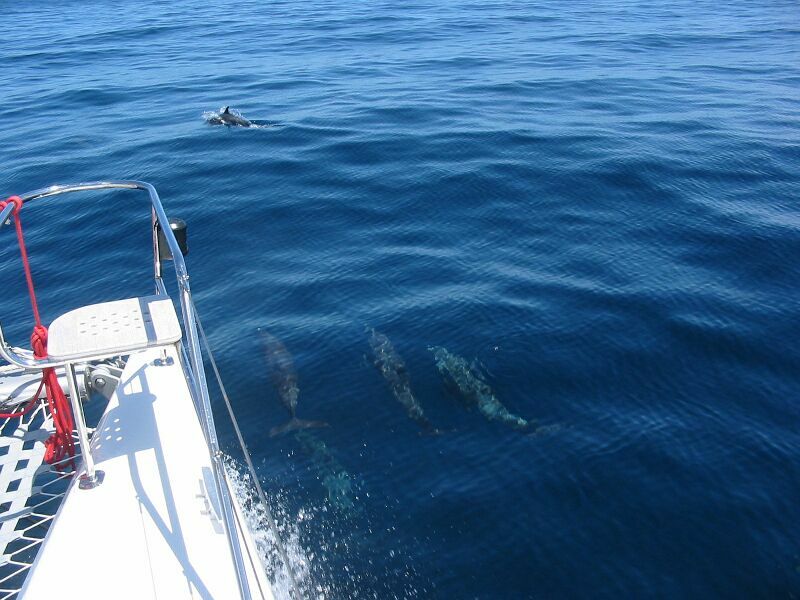 On the way, we think we spotted some small whales travelling at at about 2-3 knots. There were about 15 of them - they were a beautiful sight, but too far away to get a photo. We spent the weekend in Rodney Bay to rest and prepare for the next long passage. We also wanted to spend some time going to a few stores and getting on the Internet to update the web site at a good Internet cafe here. It was pleasant visiting a place we had already been to before, and thus already knew where customs, food, etc. were located. 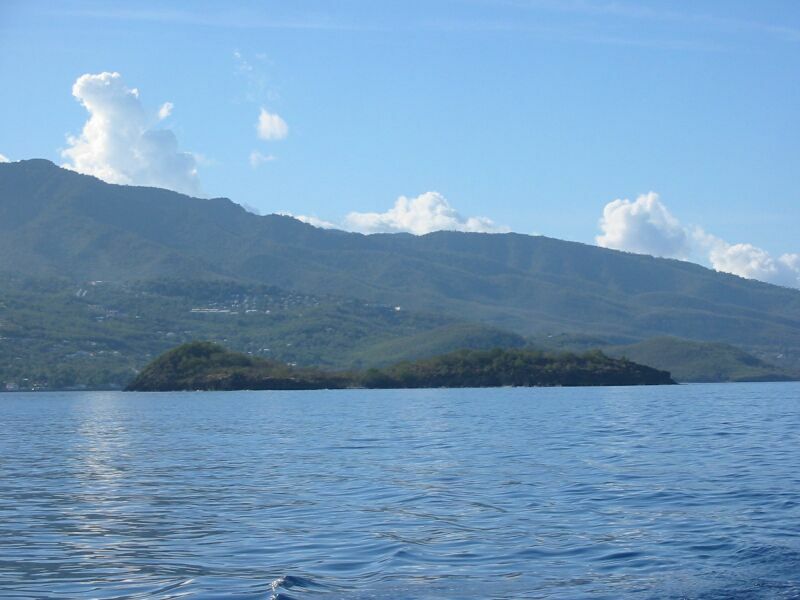 We left on Monday, March 31 at 5:00 AM from Rodney Bay with plans to sail all the way to Basseterre, Guadaloupe. 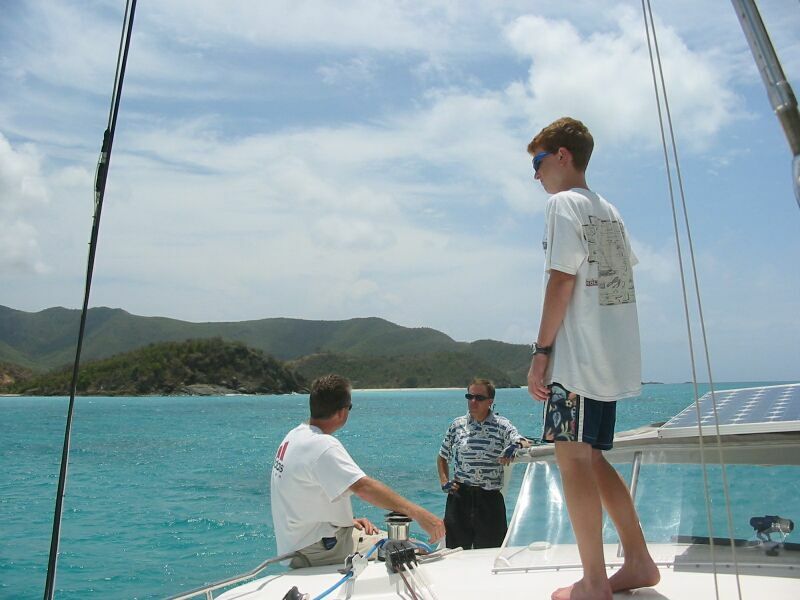 We raised sail and almost immediately began sailing (since Rodney Bay is on the north side of the island). The seas were a bit higher this time, but still less than 4-6 feet for the most part, so quite comfortable. We did have an instrument problem initially on this leg. We had been periodically having some strange behavior with our autopilot and its heading indication. Today, it was terrible. We managed to get it more or less stabilized because the wind was steady, but it required constant monitoring. Frank read the manuals, and when we were in the lee of Dominica, we stopped and re-calibrated the autopilot. This required we turn around in a circle very slowly. It took a few minutes, but the instrument indicated it had calibrated, and everything has worked perfectly ever since! We arrived in Basseterre, Guadaloupe at about 9:00 PM after 126 nm. We were familiar once again with this anchorage, and had no trouble coming in at night. After a good night's rest, we went ashore in the morning and Frank cleared both in and out of customs (we planned to leave the next morning) and then we rode our dinghy to the main port and went into town to do some shopping. Frank went to an Internet cafe and the girls shopped, then we went to lunch at our favorite Chinese restauarant here. Next we jumped on a bus and went to the big supermarket/department store called Cora. Here we bought lots of batteries as the prices on batteries are much cheaper in French islands for some unknown reason. And, Karen bought lots of fresh vegetables and meats here. Back at the boat by mid-afternoon, we motored our way up to Pigeon Island about half way up Guadaloupe's west coast. We picked up a mooring at just past 4:00 and Frank immediately went snorkeling as Pigeon Island is located in the Jaques Cousteau National Park. After a relaxing rest, Frank got up real early and took the kayak to the other side of the island to snorkel. After an hour of snorkeling, he came back and we departed Pigeon Island for our "short" (compared to the other days) 7 hour sail up to Antigua. We left Pigeon at about 8:30 AM and motored up the coast in the lee of the island - dodging lobster pots all the way. Just after we raised sail, and before we left the shallow area, Frank caught a Barracuda on our trolling line. This was the only catch on the way up, although Frank had a bigger fish on the hook for a while before we got to Antigua, unfortunately it got free somehow. We arrived at 3:00 PM after 53 miles into Falmouth Harbour. Frank went ashore to clear into customs by walking over to English Harbour. On the way back, guess who he ran into? Yep, the Walch family from Hotel California were visiting the museums at Nelson Dockyard with the Grandparents who were visiting them. The girls were really disappointed Frank got to see them, while they had to stay on the boat. But, we had plans to visit with them on the weekend. We spent a full day in Falmouth Harbour doing homeschooling, and thoroughly cleaning the boat. Thankfully, we had a good rain to help wash the salt water off. 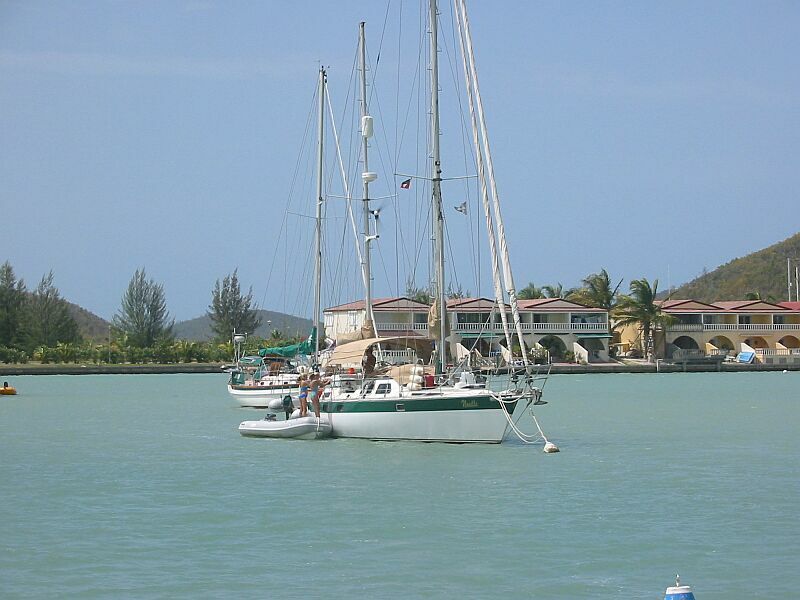 On Friday, April 04, we pulled up anchor and sailed our way over to Jolly Harbour. Jolly Harbour has a nice marina and mooring balls where for $10US we can park and have access to the pool and hot showers. Also, this is the harbour where Hotel California is located and the Walch family is staying in a villa here while their boat is awaiting repairs. 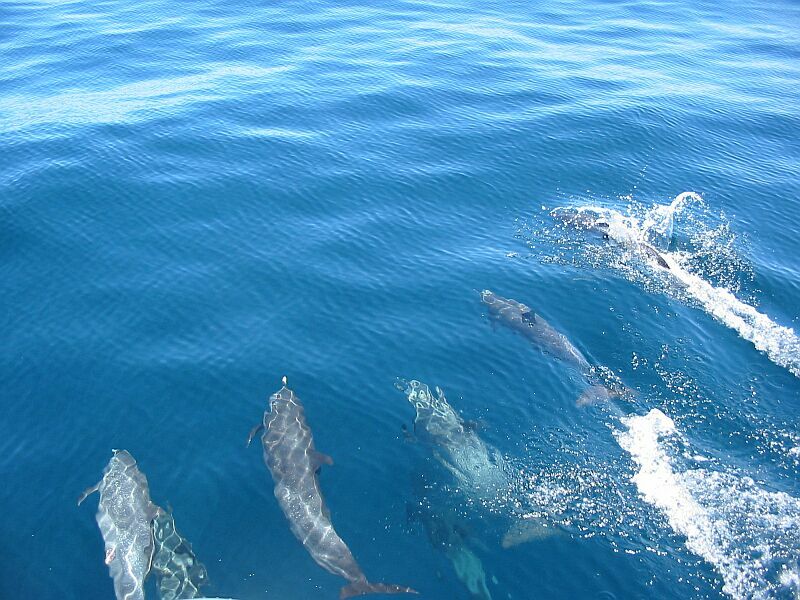 While we were getting re-acquainted with the pool and showers, we met another cruising family here. They are the Ellisons from the UK on a boat called Nosille (their name backwards). They have two young girls named Amelia and Pippa (short for Phillipa) who are 14 and 12. The parents, Valerie and Roger were thrilled to meet another cruising family - and were doubly thrilled to also meet the Walch family later. 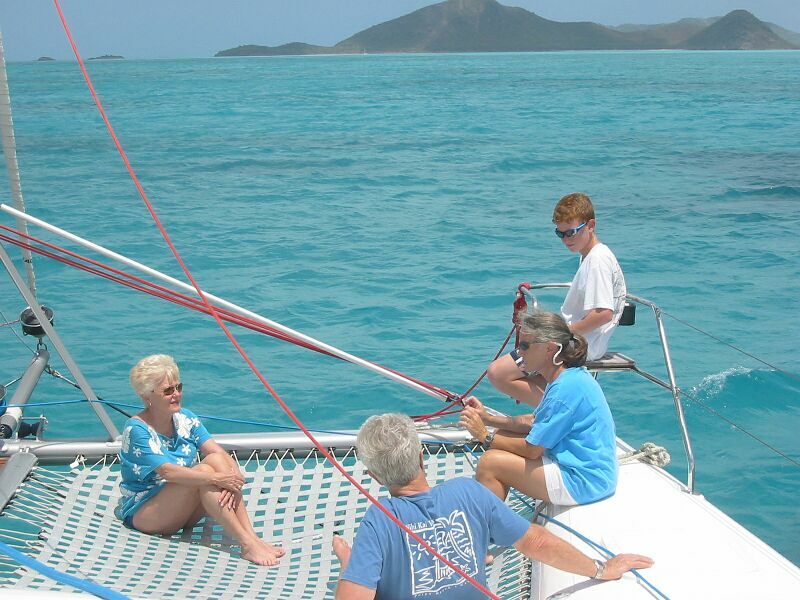 Here are some pictures from our sail with the Walch's. 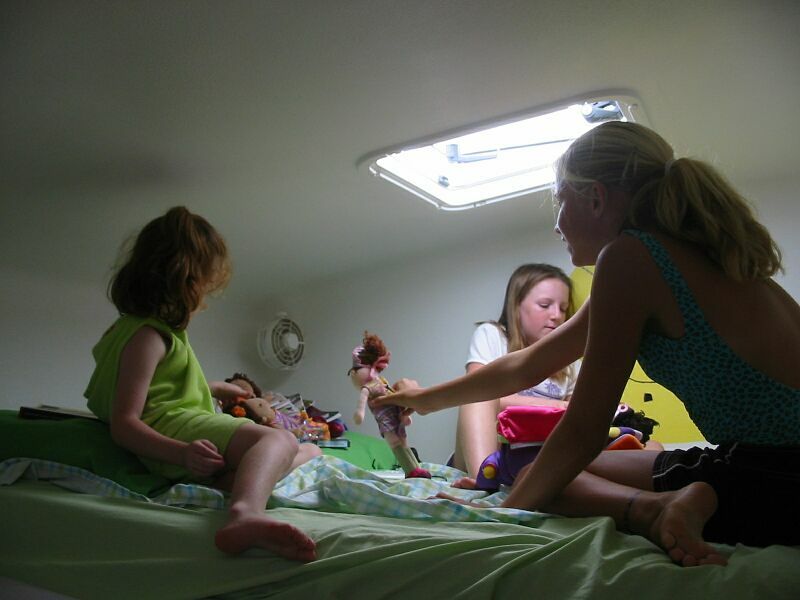 We have spent several days now visiting with both the families from Hotel California and Nosille. And plan to stay here a while longer while we decide what we're going to do next. We will update this page later with our future exploits.